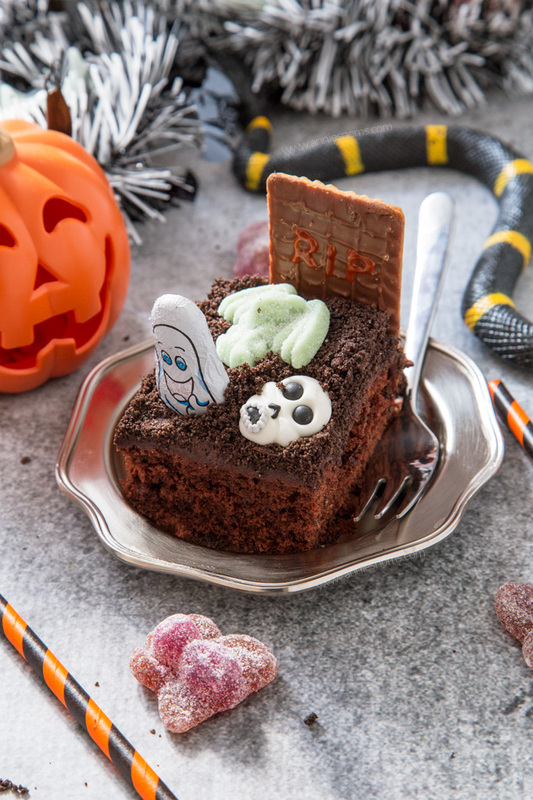 Let the kids go to town with Halloween themed decorations and create your very own delicious Graveyard Cake with a rich chocolate cake base, chocolate frosting and Oreo soil! Apologies for the slightly off schedule posting recently. Life has been crazy these past few weeks and it’s been hard to find the time to sit and blog. Anyway, hopefully things should be back to normal now, as I took a day out last week to get ahead on some recipes for the next few weeks! One of the things I made? This Graveyard Cake. I made a rich chocolate cake, topped it with chocolate frosting and then sprinkled crumbled Oreos all over the top to create soil. After that, I went to town adding spider sweets, gargoyles, ghosts, pumpkins… you name it; I put it onto this creepy cake! Now, normally I would always make my own chocolate frosting, but since I wanted to make this as kid friendly as possible, I used a can of frosting as after the adults have made the cake, the kids can get creative decorating this cake! 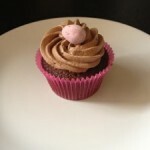 Of course, if you want to make your own frosting; my favourite chocolate frosting recipe is here. You may need to double the amount as this is a 10 inch square cake and I used a 14oz can of frosting. (You’ll need more frosting if you stick a “fence” around the cake – I chose not to in the end, but did buy Cadbury Chocolate Fingers to add if I felt like it). As for toppings, whatever you can find! I love seeing all the weird and wonderful creepy sweets the shops bring out. I mean, I don’t think we get as much as you guys in the US, but in the last few years the UK has definitely got better at Halloween! This year I found, chocolate balls with pumpkin foil liners, which is better than nothing… (I really wish we got those cute pumpkins I see everywhere on US blogs!) – But by far the best sweets I found were from Marks and Spencers! They had fizzy spider sweets, skeletons, ghosts and sour gargoyles; those were my favourite! I also managed to find some cupcake toppers in Sainsbury’s which were Halloween themed – some witches, skulls and ghosts. For the headstones, I used a chocolate covered rectangular biscuits and then used some red writing icing to pipe on “RIP” – I was thinking of doing it in white, but then I thought why not use red as it will look like blood!!? This cake was SO fun to make! Maybe I’m a big kid at heart, but it’s probably the most fun I’ve had decorating a cake in years, so I just know kids will go crazy for this cake! 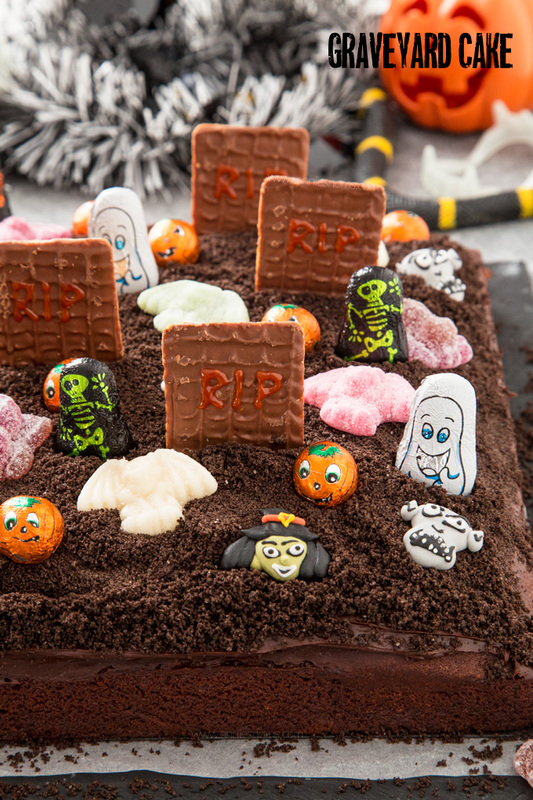 This Graveyard Cake would be perfect for parties as well as it will easily serve 20 people. So, I hope you and your children have fun making this for Halloween! A mixture of Halloween sweets; I used spiders, pumpkins, gargoyles, witches, ghosts, skeletons! I used a mixture of jelly sweets and chocolate, so use whatever you want! Preheat the oven to 180C/350F and grease a 10 inch square pan. I used a loose bottom one as I find them easier to use. Place the butter/marg and sugar into a large bowl, or the bowl of your stand mixer and beat until light and fluffy, around 2 minutes. 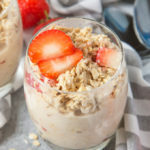 Add in the eggs and vanilla extract, scraping down the sides as necessary, and mix until well incorporated; around 1 minute. 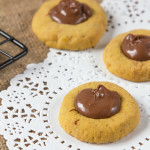 Add in the flour, cocoa powder, baking powder and salt (if using) and mix on low until the mixture begins to come together, then add in the milk and continue mixing until everything is well combined and smooth. Tip into your prepared pan and smooth over with the back of a spoon/spatula and place in the oven for 25-30 minutes, until risen and an inserted skewer into the centre comes out clean. Once cool, remove from pan and place on a plate/cake board. Using a small angled spatula, spread the frosting into an even layer over the top of the cake. If you’re going to add a fence, keep around 2oz/50g of the frosting to stick the chocolate fingers onto the side of the cake. Spoon the crushed Oreo’s over the frosting and press lightly to stick them to the frosting. Then sprinkle a little more on top, so that the finished soil doesn’t look too flat or neat! Now it’s time to decorate: I piped “RIP” onto each rectangular biscuit in red writing icing (you can use white) and then pressed them into the cake in no particular order. You can line them up, but I liked the fact they were random. After that, I just positioned all of the other jelly sweets and chocolates randomly over the top until you have your graveyard covered in all kinds of Ghoulies! 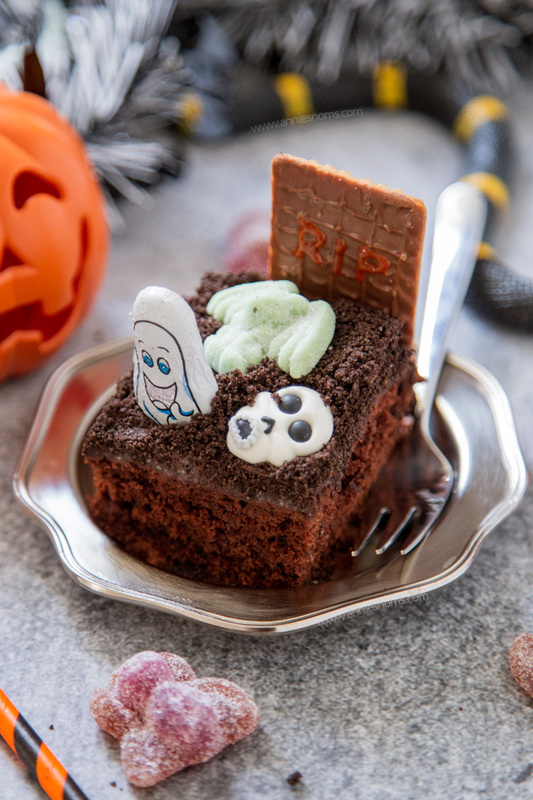 To add a fence to your graveyard: Using normal sized or mini Chocolate fingers (or a mixture of both) – place a little chocolate frosting on the flat side of each finger and then press lightly to the side of the cake, leaving a ½ inch gap between each finger! Easily serves 20 people, I sliced it into small squares and each square had a couple of sweets/chocolates on each one. Graveyard Cake will keep in an airtight container, at room temperature for 4 days, or covered with cling film as a whole cake for 3 days. *I prefer how margarine makes this cake taste, but you can use unsalted butter and then add a pinch of salt if you prefer. 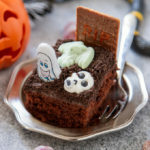 « Ghost Cupcakes – Fun Halloween Recipe! This cake looks so fun and delicious! I love the crushed Oreos! What a very cute, fun way to celebrate Halloween! My kids will love this. This is SO good! I’m absolutely loving all the Halloween themed food around at the moment. Wow that is really cute. It would be the hit of any Halloween pasty…kids and adults would love it. Such a fun idea for a kids party! Love the way you’ve decorated it, too. That gene skipped my family! 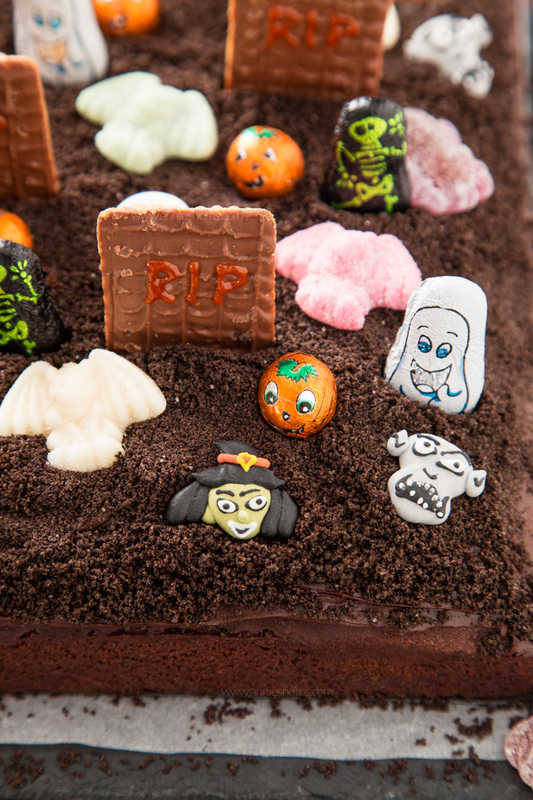 What a fun Graveyard Cake, it is awesome! Thanks so much for sharing with us at Full Plate Thursday and come back soon!